My kitchen here on The Avenue is tiny. I only have four hanging cabinets, plus one above the stove to store crayons, markers, paper, phone books, and fast food menus and the one useless one over the fridge. God only knows what's in that one if anything at all. I don't even own any kitchen spice racks. I did receive a wall spice rack as a shower gift many years ago and I don't even remember what happened to it after the spices were gone. Without a spice rack, I keep my spices on the shelf of one of the above mentioned cabinets. Problem being that when I need a spice, I have to move all the jars until I find the one I need. I was thinking of purchasing something to help me organize my spices a little better. I came across this spice rack that looks like it would work really well in the space I have. It's one of the few spice racks I've seen that I can use the original spice jars in. 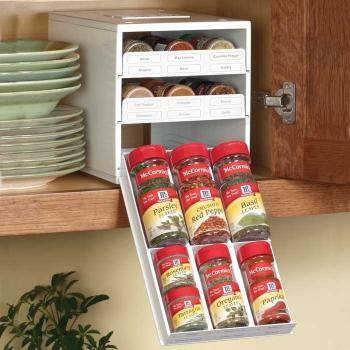 How do you store spices in your kitchen? Disclaimer: This was a paid post. Links were provided, opinions are my own. I keep my spices in a two drawers. My kitchen has many drawers and so two of the small drawers hold my spices. I think your rack is adorable.